Next week, I’m going to be in Essen for Spiel ’16 – the whole week. I think this could be both interesting and possibly overwhelming. I’m certain I’ll have a story or two on my return. I will be in Hall 2 on the table in Booth A132. Looking at the map of that hall, I’d say it falls midway along the south side of the hall, directly opposite Modiphius. 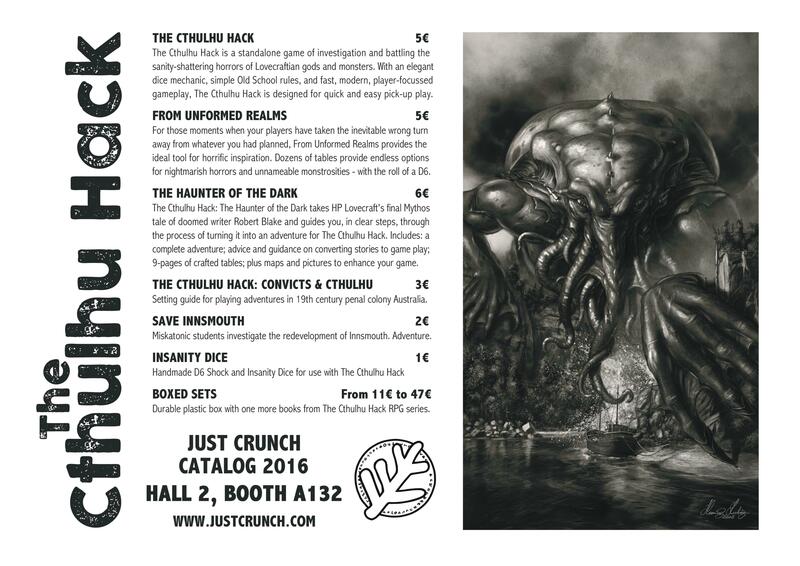 The booth will have All Rolled Up as the main focus, with a little strip focussed on the whole range of books for The Cthulhu Hack. I’ll have individual books and boxed sets, as well as a few accessories. This will be the debut for The Haunter of the Dark, as a physical book, and the brand new adventure Save Innsmouth. If you’re at Spiel next week, come and see us. We’d love to meet you – and we’ll have piles of game rolls, dice trays, books, and more product for you to see in person. After Spiel, there’s Halloween and I’ll be back to the keyboard – with work progressing steadily on Unausssprechliche Hack, the GM Screen, and another secret project. More news to come.